Individuals who are completely remodeling their bathrooms or those who just want to add a few new elements to update their space have a wide variety of styles and finishes to choose from when deciding on a bathroom faucet. And, design experts say that choosing the right faucet can influence the entire look of a bathroom. HGTV interior designer Lisa LaPorta says that a faucet is an important design choice when it comes to a bathroom renovation project, as it can often serve as jewelry for the space. "It's really important to bring metals, or what I like to call house jewelry, into your rooms," LaPorta shares on FixtureForward.com. "This is a great way to add sculpture and drama to an all simple design." 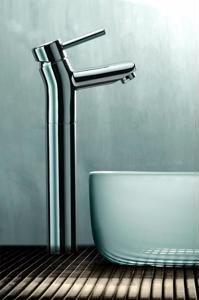 Newform's new Faucet Natura brings an extra design element to any space it's used in. According to Trendir.com, this new item is a hybrid product that combines a smooth modern faucet and a sleek useful container in one. In the bathroom, it can be used to store a toothbrush or hold a flower and add a splash of color to the space. Unique products like this one can really add a special touch to any bathroom.